To open a place that is sociable, where you can discover new things and share them with your friends, where you can eat casually and with no fuss. Our Garden is now open and is a REAL SUNTRAP! For as long as I can remember I have lived a healthy lifestyle and have loved cooking, eating and growing healthy food, but I struggled to find the kind of food that I like to eat anywhere locally. So I decided to do it for myself and Miss Walls Back Garden was born. 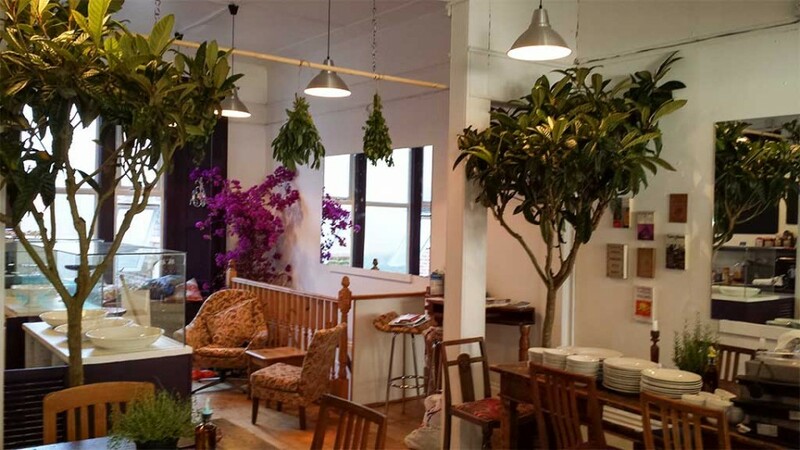 A vegetarian cafeteria selling fresh, whole, healthy food, proper good value food cooked from scratch using natural ingredients. 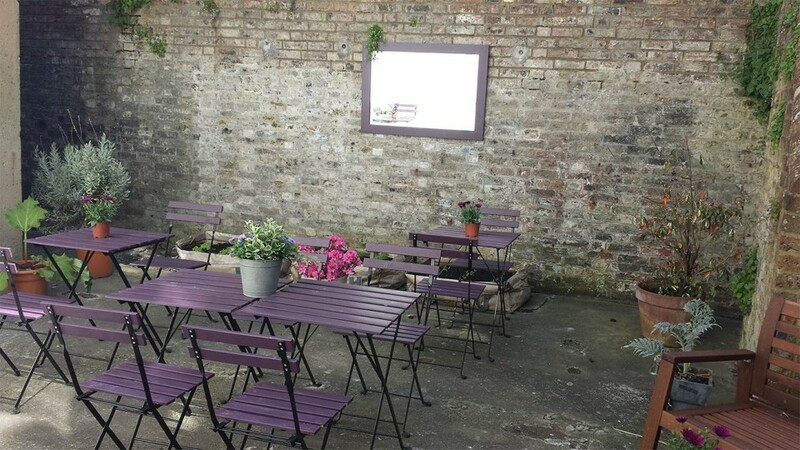 Miss Walls Back Garden is an amazing light filled space where you can sit, relax and enjoy good food at great prices. Pop in for breakfast and have a great healthy, nutritious start to your day. Enjoy some spelt, blueberry pancakes, take a super green juice or just a coffee and one of our homemade goodies. Our lunch menu changes daily so that we can make the most of the seasons and the produce available. You will always find delicious dishes, from Moroccan style soups to Thai style sweetcorn fritters and Mediterranean inspired aubergines. We now eat more vegetables than ever before and no matter what you cook there is always another vegetable dish to be discovered so many celebrated dishes are made entirely from vegetables. But the focus at Miss Walls Back Garden is also on health, cutting high GI carbs and sugar, introducing healthy proteins and raw materials. Who knew that Kale has more calcium than milk, more iron than beef and more vitamin c than oranges? 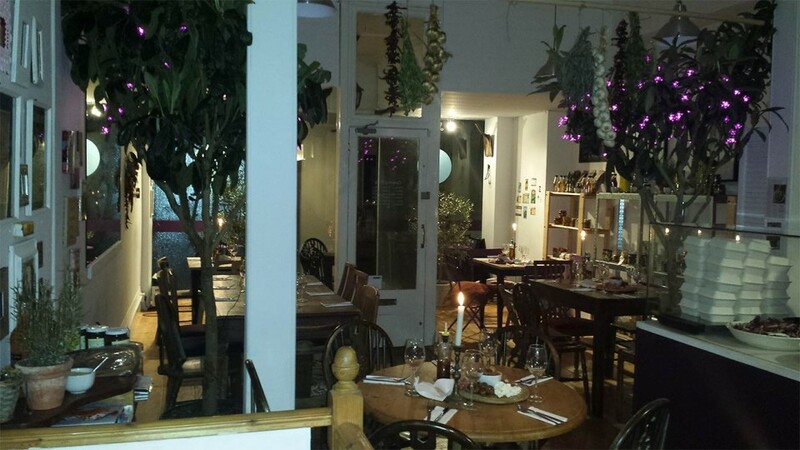 We Are Taking Bookings For Evening Private Parties. For us. Thank you, very nice staff too ! On Thursday July 24th. 2014 at around 16.30 hours, a Golden Goddess was seen flying across the Grove Road /South Street junction . She disappeared into the distance of Grange Road and our intrepid reporters wondered in amazement if they would ever see her like again . They are still reeling in wonderment . I can’t tell you just how DELIGHTED I am to find that after an eternity without a vegetarian restaurant in Eastbourne, we now have one that looks and sounds just absolutely FABULOUS! Hoping and praying for the very best for you! I shall be telling everyone I know and will see you soon!! But I admit it is a most unusual name . Was where he gained his later knowledge. Thank goodness you’re here ! We always feel the better for a visit ; see you again soon ! Yet another scrummy lunch shared with friends.. Fabulous food and welcoming atmosphere, thank you Jackie & Andrea, I will no doubt be returning again soon. I’m no veggie but this place satisfies the tastebuds in a sparkling and new way..
Yaay finally a veggie place in eastbourne!! We love the place and the food is amazing. The beetroot burger was simply awesome and your dog is cool – he had one eye on my meal! Lovely place and we wish you every success. Not only the most characterful cafe to open in Eastbourne in a long time, but run by two of the most delightful friends we have met in a very long time , Jackie and Andrea. BARBARA COOK and POLLY BERGEN ; Polly has two CDs available and Barbara has about 20 . If you don’t know Barbara Cook , she began her career in Broadway musical theatre , then as taste in the genre changed , she found a new career as a solo artist always choosing her repertoie of songs from the best writers around . Nobody finds the essence of a song as she does..Sorry to wax so high but she is stunning and still performing at 85 !!!!!!!!!!!!!! So glad to see spelt on the menu in Eastbourne, things are looking up. I shall be popping in very soon, good luck with your venture. I was returning home from a book buying excursion when I noticed a new cafe had sprung up on Grove Road. As luck would have it this was the opening day, and I was delighted to be one of the first to sample the welcoming atmosphere and delicious food. Jackie is beautiful and charming and her cafe is THE place to relax, for a simple coffee or something more substantial. Miss Walls Back Garden is a credit to the hard work and vision which has gone into creating it. Thoroughly recommended. Congratulations on realising your dream to open a 1st class Vegetarian Eatery. The website is impressive and the menu excellent, wishing you the greatest success , which you so richly deserve . Popped in for coffee last week and delighted to have you here ; so nice to support local independents .The ambience is delightful,the reception friendly and charming and the coffee superb. We shall certainly return for something more next time and shall recommend . Good luck and congratulations and long may you reign Miss Walls ! Took my family for breakfast in MissWallsBackGarden yesterday and what a fine time we had. Healthy, hearty, tasty breakfasts, great coffee and cakes too. What more could you ask to start off the day. Well done Miss Walls we will return soon! Had a quick coffee and snack yesterday (opening day) delightful new find. Really friendly and warm.